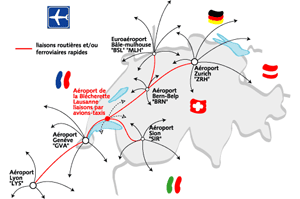 For more informations on how to get to Lausanne, see Lausanne City Official Website. See also Practical Book. Swiss International Air Lines is the official carrier for the FOSS4G2006 conference and is offering special fares to all participants. Train is the best way to reach Lausanne from Geneva Airport (see By Train). There is a train every 15 minutes and it takes only 40 minutes. If you look carefully outside, you will probably see a nice view on the Geneva Lake (Lac Léman) and the Mont-Blanc. Again, use the train. There is a train every 30 minutes and it takes 2 hours. 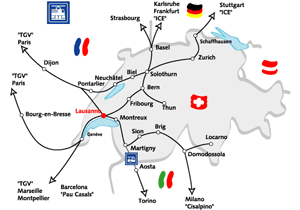 Central located in Europe, Lausanne can easily be reached by train. In Europe, please contact your usual train company to obtain more informations. 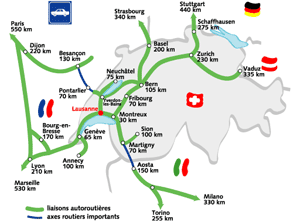 Be sure, driving network to come in Lausanne by car is really good. 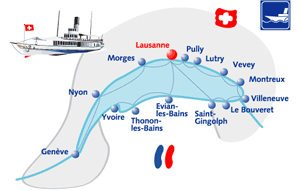 The stately white boats of the Compagnie Générale de Navigation ( CGN ) call regularly at Lausanne-Ouchy, and will take you to Morges, Rolle, Nyon, Genève, Evian, Montreux, Vevey... and many other ports in Switzerland and France. For more informations on how to move in Lausanne, see Lausanne City Official website .